Big news in Nacho Patrol land! California, our 11th state to nacho review in! Seeing as we were in one of the most famous seafood cities in the world, San Francisco, we went in search of something that has long intrigued us: seafood nachos. We found them at Playa Azul, a lovely, inexpensive Mexican joint on Mission Street. We highly recommend this place if you are looking for fresh Mexican seafood, but must warn anyone with a fear of mariachi bands to stay far away. 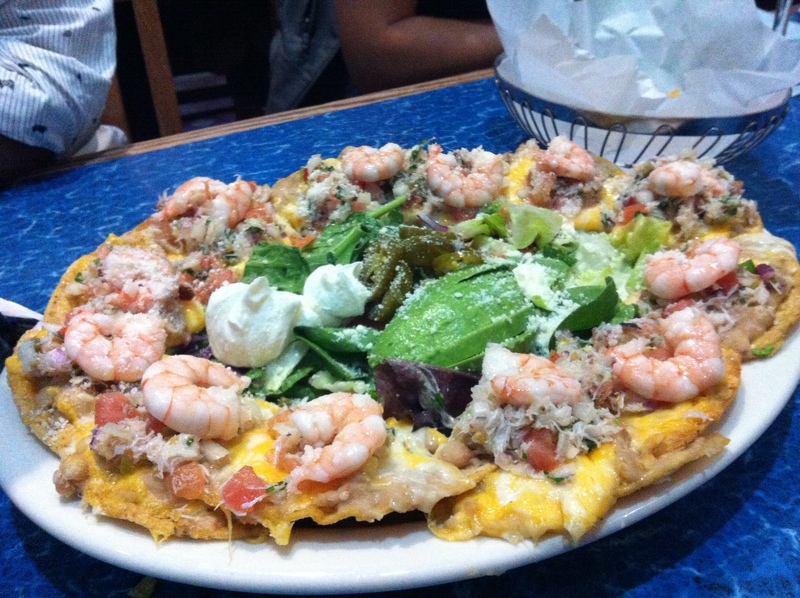 The “Nachos Playa Azul”, which you can order by the half-dozen or dozen (a first), come with beans, cheese, crab ceviche, shrimp, sour cream and avocado. Appearance: (9) Now those are some loaded chips! Each one resembled a miniature pizza slice, with a layer of melted cheese and the toppings piled high. The pink shrimp, gooey melted cheese, and verdant salad/avocado center presented a stunning sight. Quality of Ingredients: (10) The seafood was the main feature here, and it was excellent. The shrimp were well cooked and the crab ceviche was delicious. We, who hate lettuce on nachos, even loved the greens in the middle, which were a combination of arugula and spinach and very lightly dressed. Distribution of Toppings: (9) While one could not complain about naked chips here, we did wish that the avocado had already been stacked on the chips, instead of in the center where we had to apply it ourselves. Price: (8) At $17.49 for a dozen (that’s $1.46 per chip for those of you playing along at home), these are a worthwhile splurge. Overall: 36/40. These are some of the best, most interesting specialty nachos we’ve ever had. Between this and the amazing nachos at Peso’s Kitchen in Seattle, we have to wonder– are we on the wrong coast?? Tags: California, mariachi, san francisco, seafood, shrimp, vacation, Viva Mexico!